Main website for video, audio and more, An Anú’s original music. Together Liam and Helen are An Anú a relatively new Irish act, in demand both at home and abroad. 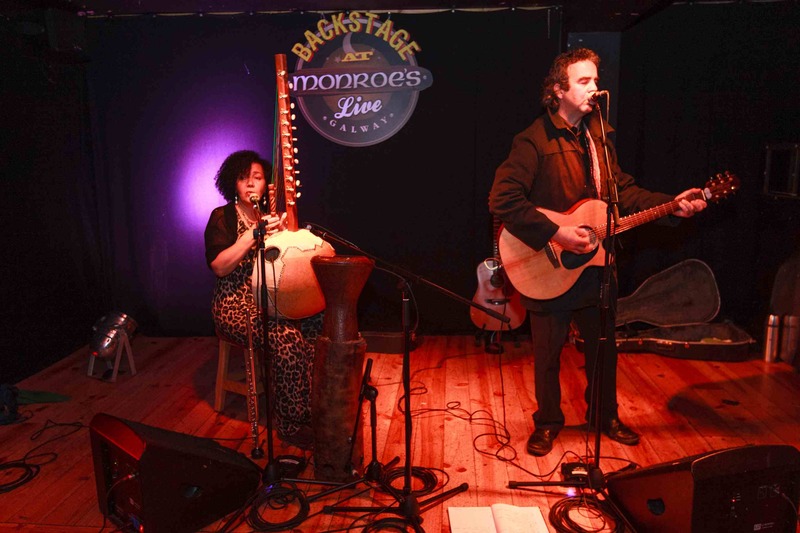 Their harmonies and vocal skills combine in featured solos and duets, their whistle, flute and guitar playing incorporates Irish traditional, folk and classic blues and roots music plus powerful and poignent original music. An Anú’s album’s Anim Chara and Celtic cousins are now available at gigs, soon to be available also on itunes. The albums contains original tracks by Helen and Liam plus traditional Irish and roots music. Anú is the Celtic Mother Earth/Creation Goddess, the queen of the ancient Irish race; Tuatha Dé Dannan. 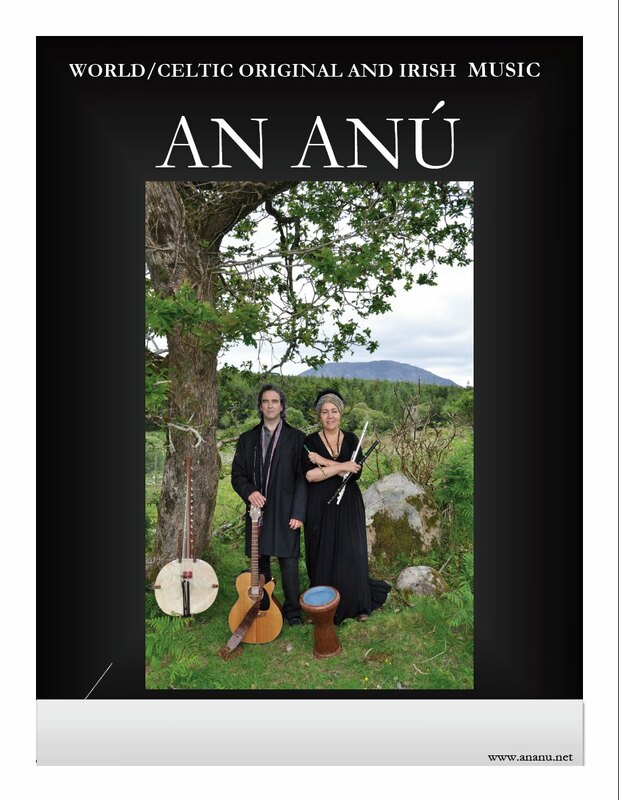 “An Anú” is an original World/Celtic musical collaboration, based in Galway in the west of Ireland, between singer songwriters Liam Mac Amaíla and Helen Webb. Featuring both original music and traditional Irish music, seasoned world class artists and performers, Helen Webb and Liam Mac Amhaíla bring together vibrant World rhythms and Gaelic Irish culture and mythology. Powerful vocalists and accomplished musicians An Anú bring a musical message rooted in mythology and history, spirituality, love and hope for the planet. Instruments include, kora (West African harp), flute, Irish whistle, acoustic guitar and darbuka. An Anú brings together vibrant World rhythms and Gaelic Irish culture and mythology. Powerful and emotive vocalists and accomplished musicians (kora, flute, Irish whistle, acoustic guitar, darbuka). Helen Webb and Liam Mac Amhaíla bring a musical message rooted in mythology and history, spirituality, love and hope for the planet. For photographs please click on the gallery link below. If original files are needed please contact An Anú using details below. To download a copy of An Anú’s poster please click on the link below Any issues and we can send you an original. 2 Vocal and 3 acoustic instrument mics and 5 boom stands. mic 5 kora (may not be required, please confirm if kora will be used) mic is usually placed inside the kora, but if its a condenser mic use a boom stand. PA system – tops and bins, crossover, DI Box, Stage Lighting, Monitors. Round table, less than 2 feet high with 5 to 10 candles, crystals, flowers, branches or whatever is available. The musicians will sit on two chairs with a third chair for instruments. Candlelit room for the performance. Main website for video, audio and images, An Anú’s original music.